In this post we share what we know to be the essence of what took place, however, some of the details have yet to be worked out. There is hope that someday new information, whether in the form of a will, log, testament, publication, etc., will shed light on some unknowns. Circumstantial evidence abounds, but there is hope that someday our unanswered questions will remain as such no more. As was previously mentioned, there is some controversy and disagreement regarding the patriarchal Hans Herr. Lingering questions exist as to did he, and if so, when did he immigrate to North America, specifically what would eventually become Lancaster County? Did he come over in 1710? Or did he come in 1717? No mention or listing of him at that age has been found. He apparently came sometime, since he is buried in Lancaster County, in the Willow Street Mennonite Cemetery, having passed away in 1729. …A council of the whole society was called; at which their venerable minister and pastor, Hans Herr, presided, and after fraternal and free interchange of sentiment, much consultation and serious reflection, lots, in conformity to the customs of the Mennonites, were cast, to decide who should return to Europe for the families left behind and others. The lot fell upon Hans Herr, who had left five sons, Christian, Emanuel, John, Abraham and one, whose name we have not learned. This decision was agreeable to his own mind; but to his friends and charge, it was unacceptable; to be separated von ihrem prediger, from their preacher, could be borne with reluctance and heaviness of heart only. They were all too ardently attached to him to cheerfully acquiesce in this determination –reluctantly they consented to his departure—after much anxiety manifested on account of this unexpected call of their pastor from them; their sorrows were alleviated by a proposal made on the part of Martin Kendig, that, if approved, he would take Hans Hen’s place—this was cordially assented to by all. 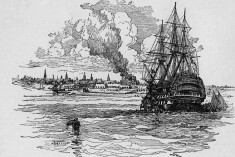 Without unnecessary delay, Martin, the devoted friend of the colony, made ready –went to Philadelphia, and there embarked for Europe; after a prosperous voyage of five or six weeks, he reached the home of his friends, where he was received with apostolic greetings and salutations of joy. Having spent some time in preliminary arrangements, he and a company of Swiss and some Germans, bade a lasting adieu to their old homes, and dissolve the tender ties of friendship with those whom they left. With his company, consisting of the residue of some of those in America, and of Peter Yordea, Jacob Miller, Hans Tschantz, Henry Funk, John Houser, John Bachnian, Jacob Weber, Schlegiel, Venerick, Guldin, and others, he returned to the new home, where they were all cordially embraced by their fathers and friends. So Martin Kendig returned to the Palatinate (Germany) from Pennsylvania in 1715 or 1716 to encourage his fellow Mennonites to join the small group that had settled in Lancaster County in 1710. And in February, 1717, five Swiss Brethren leaders conferred at Mannheim and decided to come to America. These five were Benedict Brackbill, Hans Burkholder, Melchoir Zaller, Hans Rub and Peter Donens. Some of the Brethren “started leaving in March of that year to journey to London. By May, some had received certificates which allowed them to receive help from the Dutch brethren when they arrived in Holland. Though not known for sure, it is highly likely that between Benedict Brackbill’s travels and Martin Kendig’s journeys up the Rhine River valley that word of land in the Province of Pennsylvania would reach Ibersheim where our Brubacher-Brubaker ancestors would hear of this new land of peace and opportunity. Sometime in June of 1717 our Brubacher-Brubaker ancestors were more than likely among the 363 Mennonites who sailed down the Rhine River to Rotterdam and then on to London, before continuing on to North America. Under this date, we are given knowledge of the first ship lists of Mennonites, who were coming to Pennsylvania, and up into the Susquehanna Valley. In Vol. 3 Col. Rec., p. 29, it is stated that Captain Richard, Captain tower and Captain Eyers (Ayers) waited on the Council of Pennsylvania with a list of Palatines or Mennonites they had brought over in their ships form London. The names are not given, but the record states that Richards had 164, Tower 91 and Eyers 108; this makes a total of 363 persons. This throws some light on how rapidly our Swiss ancestors were coming to this section. We believe that nearly all of these settled in Lancaster County, because in the year 1717, all who came over were coming up to this region. In 1739, a list of 178 Lancaster County German-Swiss were naturalized and likely, many of these were among the list. 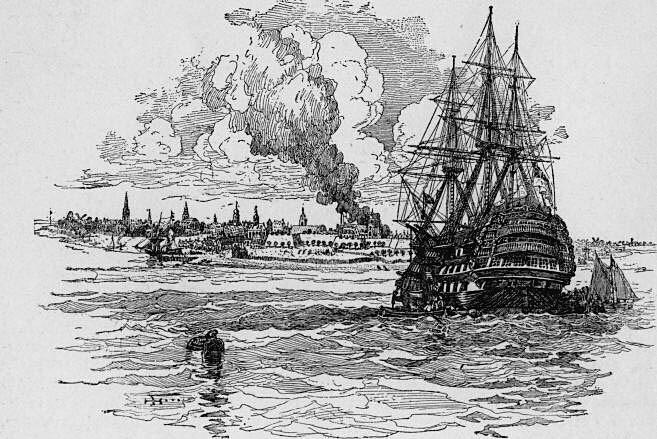 On August 24, 1717, three ships carrying 363 Mennonite passengers arrived in Philadelphia. 1. Brubaker, Landis H. “Benedict Brackbill (1665-1720)” Mennonite Research Journal, January, 1961. 2. Davis, Richard Warren. “Swiss and German Mennonite Immigrants From the Palatinate, 1704-1717,” Mennonite Family History, January, 1994. 3. Eshleman, H. Frank. Historic Background and Annals of the Swiss and German Pioneer Settlers of Southeastern Pennsylvania, and of Their Remote Ancestors, from the Middle of the Dark Ages, Down to the Time of the Revolutionary War, Lancaster, PA. 1917. Pp. 201, 202. 4. Gibble, Phares Brubaker. History and Genealogy of the Brubaker, Brubacher, Brewbaker Family in America. Lititz, PA: Eastern Pennsylvania Brubaker Association, 1951, 1979. Pg. 43. 5. Minutes of the Provincial Council of Pennsylvania May 31, 1717 to January 23, 1736. 6. Rupp, I. Daniel. History of Lancaster County To Which is Prefixed A Brief Sketch of the Early History of Pennsylvania. Lancaster, PA Gilbert Hills, 1844.